CHANGE THE COLOR OF YOUR FURNITURE! These photos (below), even on the best monitors and computers, do not do justice to the actual results when seen in person. Send us a sample of your carpet or call us for an evaluation and we will respond with a proposal for dyeing or restoring the color of your carpet. © 1988-2014 CYC All Rights Reserved. All material is copyrighted and protected under USA and International Copyright Law. 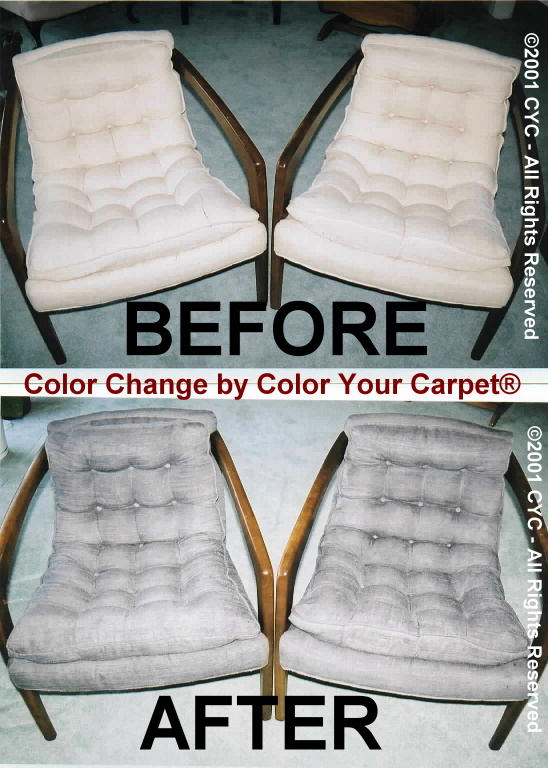 We can restore the color of your carpet to the original color. In this case we changed the carpet from discolored, stained and faded light gray color to the original "smokey gray". This faded light gray carpet suffered from unsightly stains, discolorations and an overall "washed out" color that made the carpet look old and incompatible with the room colors. To view the pictures in more detail, open the image into a new window at full size. After our color restore process, all stains and discolorations are gone and the carpet is restored to an even tone and although hard to see here, the "in person" results astounded the customer. We can restore or change the color of your favorite piece of furniture to the original color or change it to a brand new color completely. This set of chairs was in great shape but the white color was wrong for the new home decor and the customer was really tired of trying to keep the chairs clean and white. We changed the color to a more modern regal gray color and of course all stains and "yellowing" were removed. The result, a brand new looking set of chairs at a substantial savings to the customer instead of costly new furniture. Carpet dyeing services may be the perfect solution! 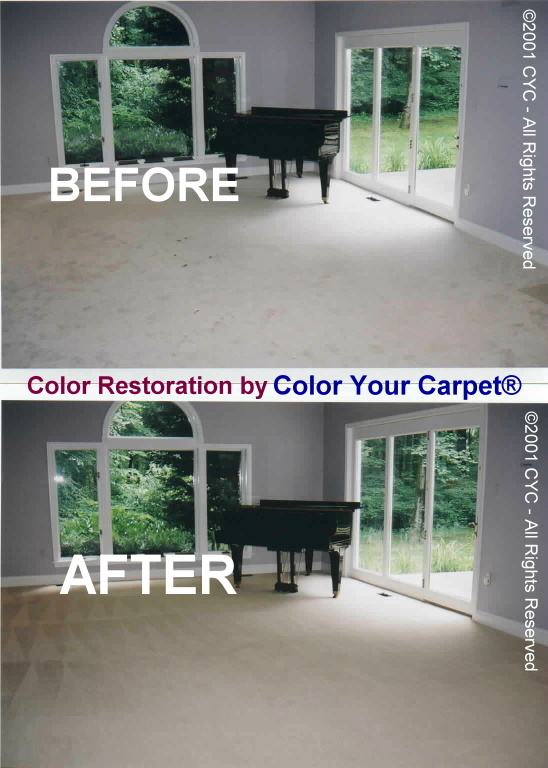 Color Your Carpet® is Dyeing to Serve You! A complete carpet dyeing information source. Copyright © 1988-2014 CYC All rights reserved.